In this book short-cuts have been given to solve objective type sums in minimum possible time. In order to solve objective type sums one should have conceptual clarity and should be able to apply the concepts properly. Almost all books containing objective type sums do not contain subject matter. In fact they provide a collection of problems. That is why students required other books to study subject matter and to build up concepts before they start solving objective type sums. Keeping this requirement of students in mind, I have discussed the subject matter in detail with suitable illustrations so that a reader of this book may not feel the need of consulting any other book. 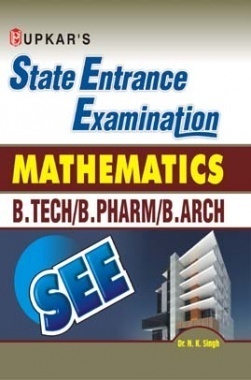 This book Useful for B.Tech/B.Pharm/B.Arch Entrance Examination. 1.In each chapter, subject matter has been discussed in a systematic and lucid manner with illustrations. 2. Illustrative objective type examples have been given to enable the students to apply the concepts studied, in subject matter, in solving objective type sums.